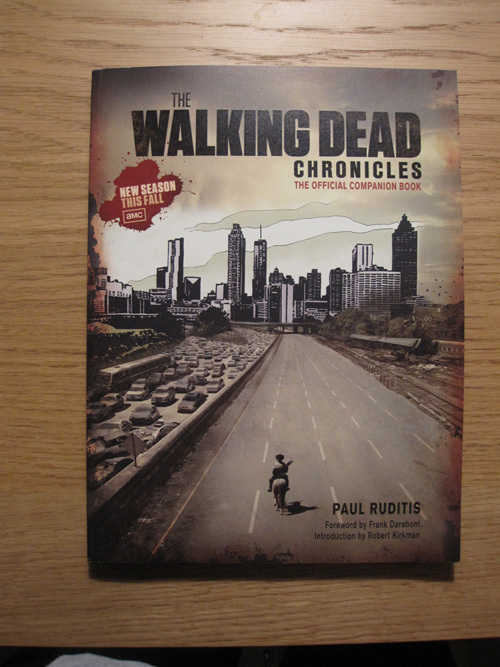 This book is a must for all fans of the series. 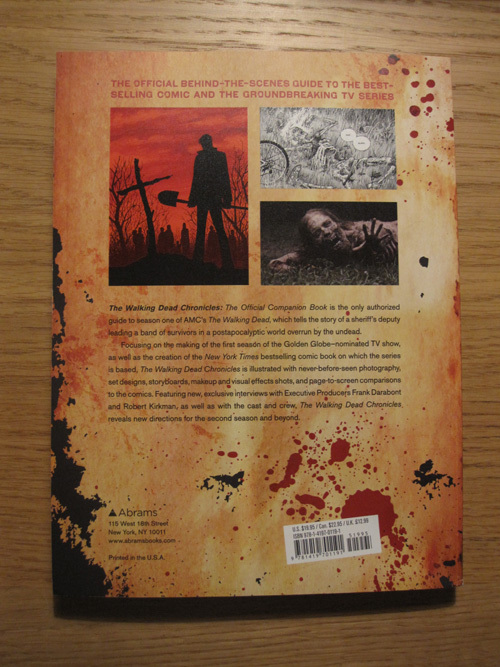 It's like the bonus material on a DVD but in book form. 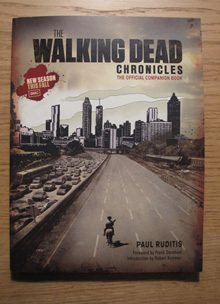 The Walking Dead Chronicles: The Official Companion Book is the only authorized, behind-the-scenes guide to Season One of the white-hot new AMC television series, The Walking Dead, which tells the story of a sheriff’s deputy leading a band of survivors in a post-apocalyptic world overrun by the undead. 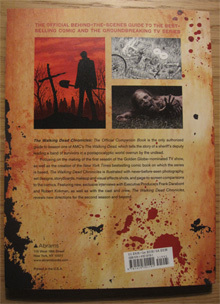 Focusing on the making of the first season of the Golden Globe–nominated TV show, as well as the creation of the New York Times bestselling comic book on which the series is based, The Walking Dead Chronicles is lav­ishly illustrated with never-before-seen unit photography, storyboards, set designs, makeup and visual effects shots, and page-to-screen comparisons of the comic and TV show. 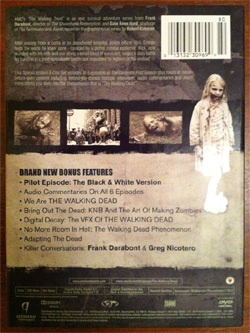 Featuring new interviews with series creator Robert Kirkman and executive producer Frank Darabont, as well as the cast and crew, the book also includes sidebars that serve as a detailed episode guide, reproducing excerpts from early drafts and final scripts, and revealing new direc­tions for the second season and beyond. Here is a sneek peak of episode 3 of The Walking Dead. The Walking Dead already greenlit for a third season? 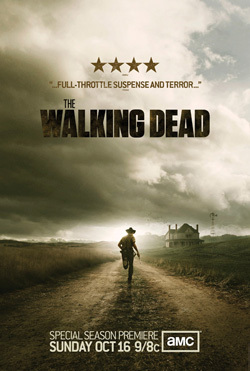 Dread Central reports that AMC has already greenlit The Walking Dead for a third season. Read more here. 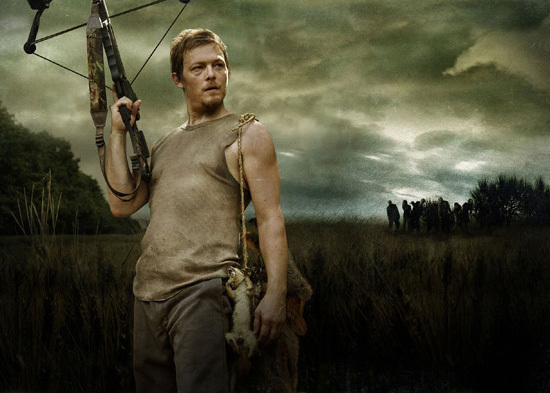 Here is an interview I did with Norman Reedus that plays Daryl Dixon in The Walking Dead. Zap2it had a chat with Romero where we told them he turned down working on an episode of The Walking Dead and hasn't even seen any of the episodes. George Romero, who pretty much put movie zombies on the map, says he doesn't really get the hype about the super-trendy creatures. 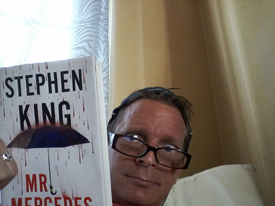 And, in fact, he's never watched one episode of AMC's "The Walking Dead," although he's hosting the network's "FearFest" which kicks off Sunday, Oct. 16, with the show's season 2 premiere. 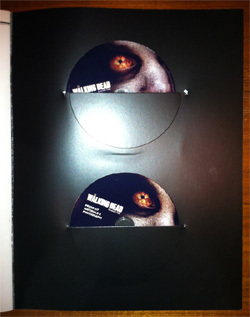 "I haven't seen any of the episodes," Romero tells Zap2it. And not only has he not watched the show, he tells us he turned down an offer to work on an episode. "Frank [Darabont] and [Greg] Nicotero were calling me and asking me to do one of these," he says. "I don't have any desire to do one because it's not -- my zombies live in sort of my universe and they're political and they're different from whatever that is." He continues: "I'm not trying to capitalize on a trend. When I want to write about something, I try to use zombies to do it because it's easier than trying to write a piece about citizen journalism. It's easier to put zombies in it and make fun of it." Is he just sick of zombies in general? "I'm not really a fan of the fact that they've become as popular as they've become because I used to think that I had them in my pocket somewhere," says Romero. "And now they're sort of all over the place and I'm not thrilled." Judging from the success of The Walking Dead and the not so big success of Romero's last Zombie movie maybe it was a mistake to not work on The Walking Dead? What do you think? Comment on facebook. And here is a clip from The New York Comic Con panel where the cast of the show talks about season 2. Here are my thought on the first two episodes of season 2 of The Walking Dead. Here is my review of the special edition DVD of season 1 of The Walking Dead. 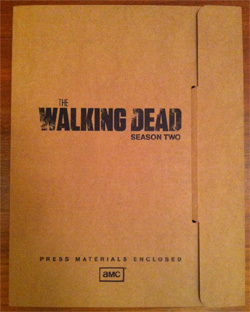 Here are some interesting articles about The Walking Dead season 2 that premiers this Sunday. I saw the first two episodes yesterday and let me tell you, if the rest of the season is as good as these two we're in for a treat. Also, season 2 will air in 120+ countries within a few days of its October 16th US premiere. How about that? 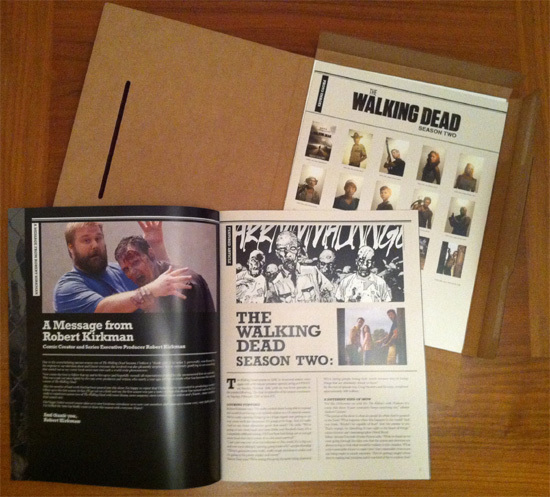 Today I got both the press kit for season 2 and the special edition DVD of season 1 of The Walking Dead in the mail and after having seen the two first episodes of season 2 I am sold. Season 2 will be just as good as season 1 was if they continue as they have started (review to come). The special edition has, in addition to everything that’s on the regular edition, some extra bonus material but it also have the pilot in black and white (review of that is coming as well). Here is an interview with the creator of The Walking Dead Robert Kirkman. Here is a photo of the cast of Being Human. 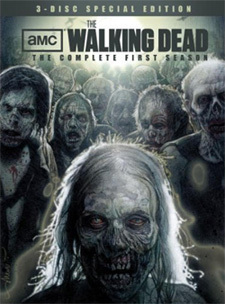 Season 2 premiers on SyFy on January 16, 2012. 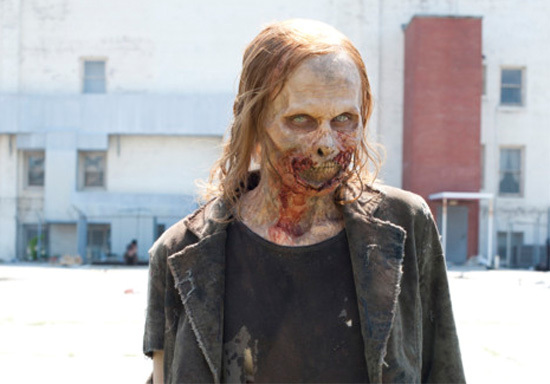 Here is an interview with Sarah Wayne Callies as well as a sneak peek from The Walking Dead.